Welcome to the perfect family getaway. A large house for a family, or the perfect place for multiple couples to getaway from the city to relax. If you are looking for a BIG holiday home, close to the beach, with a great mix of luxury and space, then look no further. - 17 x 5 star reviews can't be wrong! - 80 minutes from the CBD of Sydney. - 6 minutes walk to glorious Copacabana beach, the shops, and cafes. 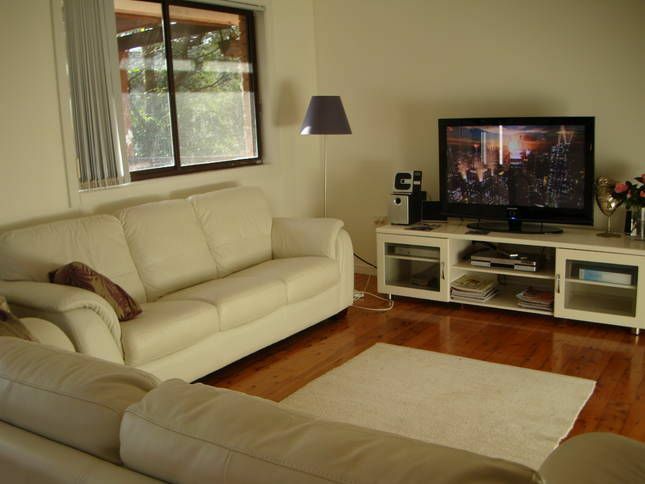 - TWO separate living rooms with huge lounges and 2 plasmas and Foxtel IQ. Yes TWO! One living area with a table tennis table. - Plenty of board games and books to read. Toys for children. - Just installed two brand new top of the line split systems to make your stay completely comfortable. - Two newly renovated bathrooms,including toilets, one with bath. Separate toilet room. - Full kitchen upstairs with large double door fridge and another fridge in the laundry. - Valley views from 2 verandas overlooking the backyard. - Love your coffee, well bring your favourite blend as we have an nespresso machine ready to be used and enjoyed. During the year we have a two night minimum stay. From the middle of December to the end of January we have minimum weekly stays and the change over day is Saturday. ** PLEASE NOTE: I know that your holidays are important to you and you would like answers ASAP. I will respond within 24 hours. So please only call me if I have not responded within this time frame, thank you for your understanding on this. Also this is a family home. If you are looking for a SCHOOLIES/BUCKS style holiday this is not the home for you. The house is split over two levels, perfect for two families or just to create some space between the kids and the adults. Upstairs is 3 bedrooms and 1.5 bathrooms, 2 with queen size beds, the third has a set of bunk beds, the bottom bed being a double bed. The upstairs living room includes 2 big leather lounges and a 42" plasma - with Foxtel IQ of course - (perfect for watching the cricket over summer or send the sport watchers downstairs so you can curl up on the lounge and read in peace) and opens on to a deck with peaceful valley views, the deck also overlooks the large backyard, perfect for the kids. Of course the living area is air conditioned. The kitchen is open plan to the upstairs living room, which keeps everyone involved in the action. The modern kitchen with a Bosch stainless steel dishwasher (essential for any relaxing break) makes it a joy to prepare meals on your holiday. Downstairs the second living room (rumpus room) has ANOTHER 42" plasma and its own Foxtel, which is enjoyed on another MASSIVE lounge. Even better for watching sport with the boys, or cracking out the Playstation. This room also has a table tennis table. - The perfect hideaway for kids of all ages. The second bathroom is located on this level. It is a fully refurbished modern bathroom with an amazing shower. There are two more bedrooms downstairs one Queen size, and one with a zip together King size bed alternately 2 single beds. There is a full laundry downstairs with Maytag 7.5kg commercial washing machine to minimise those loads of washing on holiday, and of course a beer fridge. The rumpus room also opens onto a larger veranda which again looks over the backyard and offers the perfect spot to catch the afternoon sun, assuming you are not on the beach of course. And of course we have all the items you expect at your beach getaway, BBQ's, DVD player, stereo, plenty of books and games, wireless ADSL2+, just what you would expect if you owned the place yourself. We are even pet friendly (outside only). If you are unfamiliar with Copacabana you are in for a treat. The whole suburb is just what you want from a beach retreat, forget the pretension of the Sydney beach suburbs and relax into the good old style beach/ community atmosphere. But you won't be sacrificing the creature comforts, you still have a choice of cafe's, the general store, bottle shop and the fish and chip shop - but without the need to get out of the boardies. Fine dining experiences are close by. The beach is patrolled all summer long by the Surf Life Saving club for that peace of mind. And if you're a surfer you will probably already know that Copa is famous for its Left hand point break (with Avoca Beach next door offering the opposite break so you will always have a wave to catch), and for the less adventurous there is the rock pool, and rock ledge for the kids. And did we mention the parklands out the back? Tennis court, basketball court, and plenty of room for a full game of football or cricket. There is also a skate ramp down by the shops as well. Its ticked all the boxes hasn't it? So what are you waiting for? Once you are ready to book or make an inquiry please just send an email. We will get back to you with in 24 hours. If you have not heard within that time then please do not hesitate to call directly. We are easy walking distance to the beach. We have two distinct living areas, both with televisions, one includes a table tennis table. We thoroughly enjoyed our stay at "hello". The house was extremely spacious, very clean and modern. The home was packed with activities, board games, and other great items to keep us all entertained. A great location, with only a short 5 minute walk to the beach. Thank you for your review. We are glad you enjoyed yourselves. Shirley. Comfortable and Modern - Everything you need! We stayed here for a long weekend, visiting the Coast for a family wedding. We were surprised to find just how big and spacious the house was, and how many little extras (e.g. tea bags and vegemite) were there for us to use. Cannot wait to visit again, we loved the house and the location. Thanks Chloe. We are glad you enjoyed your stay. Shirley. My family and I thoroughly enjoyed our stay here. There was plenty of everything we needed in the kitchen, great size living areas for our families to enjoy and very close to the beach. There are plenty of toys, games and DVDs to enjoy and due to the unexpected rain, the house had enough to keep everyone busy. Very fast free internet and the street it is very friendly. Thanks Rachael. We are glad you enjoyed your stay. Come again sometime. We had a lovely break at Copacabana "Hello" - it was the perfect place for a family reunion getaway. There was plenty of room for everyone to have their own space, and it also meant that even with one day of really wet weather we still had plenty to do in the house and spaces to explore! My son loved the pool table, my mother loved being able to sit on the deck and enjoy the outdoors - it works for all generations. The kitchen was one of the best equipped we have found in any holiday rental - perfect for preparing meals. The house was clean and quiet, in a good location that was walking distance to the beach. Thank you Kate. We are glad you had a relaxing time. Hello to an amazing weekend! this is an amazing place to have a little getaway with the family or friends, we spent a weekend here and were amazed by this place, cant wait to come back and enjoy another weekend. Thank you Jamie for feedback. We are glad you enjoyed your stay. We look forward to seeing you again. Our area is great for swimming and beach activities, with many other beaches close by. It is within walking distance to the beach and the shops. The local bus stops out the front.